The Common Sense Guide to Dementia for Clinicians and Caregivers provides an easy-to-read, practical, and thoughtful approach to dementia care. 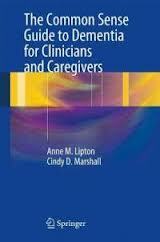 The Common Sense Guide to Dementia for Clinicians and Caregivers by Dr. Anne M. Lipton and Dr. Cindy D. Marshall. Put away the 36 Hour Day and the other books. This is by far the best and most useful book for caregivers on dementia. First, it's short. No trudging though page after page of long winded explanations. Second, there's little or no doctorspeak. It's plain understandable common everyday people speak. Each chapter and each section within the chapter is a quick read, direct, honest and just plain works. Pretty much everything you need to know is addressed, if not in specific terms, then in generalized concepts that can be modified and applied to the situation at the moment. From visiting the doctor for diagnosis, all the way through the end of the disease, this book covers it. The beauty of the book is that you can consult it on the fly, reading just what you need to mitigate the crisis or you can read it cover to cover for a comprehensive view of caring for someone with a cognitive disease. It even addresses legal issues and additional options for care to prevent breakdown for those caregivers determined to "go it alone". This book is just what the title says, full of "common sense" for caregivers of persons with dementia. Bravo Drs. Lipton and Marshall. Well done. I wish I had written this book. I'll be telling all my clients to get this book PRONTO!! !